We can also supply you with all your cabling needs such as: adding extra TV points, connecting or adding extra phone lines, adding data points for your internet and installation of hubs which allow you to connect all the above. In this day and age we are turning to NBN (National Broadband Network). We can wire your house to be NBN ready. Would you enjoy the privilege of having your very own cinema in your home? 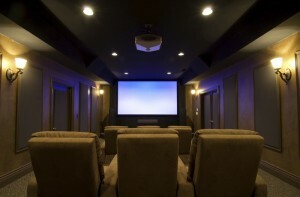 With our audio visual systems, we can connect your own theatre system in your own home. From large screen TV’s, projectors, surround sound, HDMI (High-definition Multimedia Interface) and AV inputs. Also we can install music distribution systems, where speakers are distributed through your home and can be accessed throughout your home, whether it’s the radio you want to listen to or your IPod, you can access it all throughout your whole house with only a couple of clicks.